What makes this portrait so charming is the mutual love between boy his Manchester Terrier. The pose is very natural and relaxed. This is due in part to advances in photographic technology in the 1880s which reduced exposure times needed for indoor portraits from minutes to just a few seconds. 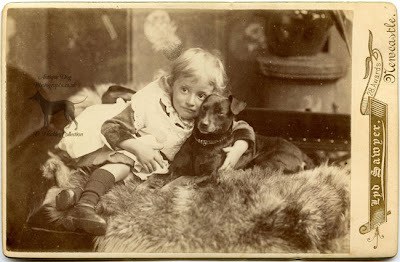 This photograph was taken by Edward Lyddell Sawyer. Born in 1856 Lyddell was the son of Henry Sawyer, portrait painter & photographer (1830 - 1896). 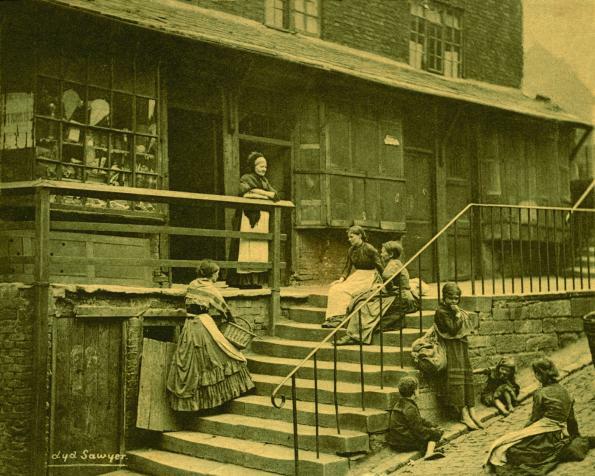 Aged 15 he began working in his father's Newcastle Studio before establishing a photographic business of his own, also in Newcastle, in mid-1885. In 1895 Lyddell moved to London and opened another studio in Regent Street. In his spare time he began to experiment with taking landscape pictures in a naturalistic style. During this time Lyddell gained some eminent friends in the photography world including Whitby photographer Frank Meadow Sutcliffe and Henry Peach Robinson. Lyddell was a member of the Photographic Society (later The Royal Photographic Society) from 1881. However in 1895 he became a member of the Brotherhood of the Linked Ring (founded by Henry Peach Robinson in 1892). The Brotherhood sought to break away from the Photographic Society, who they believed did not understand "the photographic art", and saw photography as more of a science. The Brotherhood had some what of a mystical hierarchy, and every member, or "link" chose for themselves a pseudonym. Lyddell was known as "Sheriff". The Brotherhood represented themselves with a logo of three interlinked rings, which were meant in part to represent the Masonic beliefs of Good, True, and Beautiful. As much as he saw himself as an artist Lyddell was commercially aware. 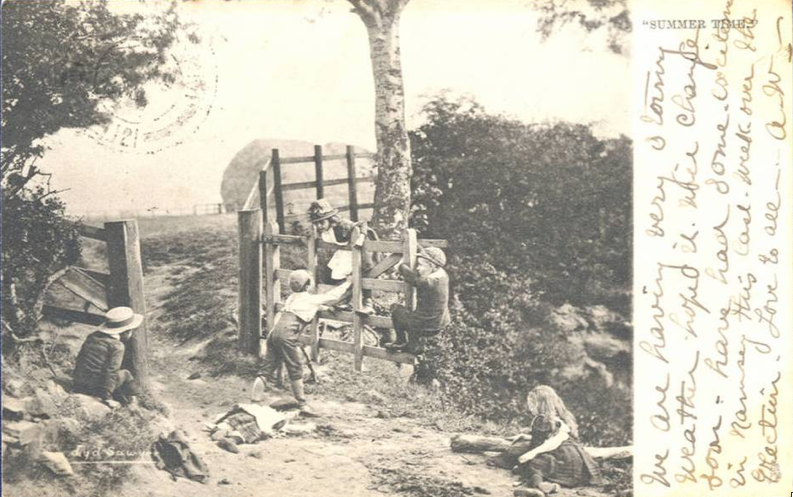 He was one of the first photographers to see the potential to make money by publishing some of his photographs as picture postcards. He began doing this around 1902, using photographs that had often been taken years previously. 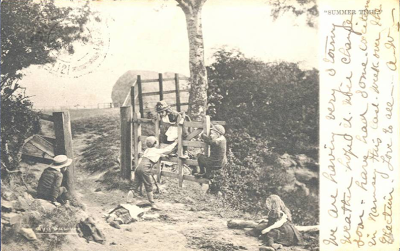 The photograph featured in this article is from the personal collection of D.Hockley. 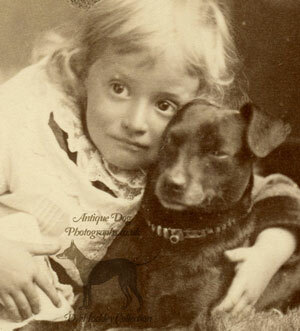 You can look forward to more Manchester & Black and Tan Terrier photographs from his collection appearing on Antique Dog photographs over the coming weeks. My favorite old photos are children with pets. They look so sweet and trusting. Some things never change with time.